Happy Monday, friends! How is everyone doing today? I'm hanging in over here at the Ten June house... finishing up all of the last minute baby stuff and anxiously awaiting our little pea pod's arrival! This weekend, David and I finished up the changing table area. It rocks my socks off. Well, as much as a changing table should rock anyone's socks off, of course : ) Let's check it out! It took me awhile, but we finally settled on using the Ikea Hemnes dresser in gray-brown. Originally, I had planned to use the white version of this piece in the room, but once we got to the big ol' Swedish home decor mecca, David decided he really loved the gray-brown version. The white is a tad bit shiny/glossy on the top piece, which is made out of particle board. [Side note: there is nothing wrong with Ikea's particle board in terms of safety for the baby! Check out this amazingly informative article by Rebecca over at The Lil' House That Could to learn more!] In the gray-brown version, the dresser top is the same finish as the rest of the piece and is made out of solid wood. With that said, David's vote went to the gray-brown and I (being the awesomely agreeable wife that I am, duh) went with it. Once we got it home, panic sunk in. Maybe I shouldn't have been so awesomely agreeable... I didn't love the gray-brown finish in the room. What was supposed to look eclectic and not too matchy with the rest of the furniture looked... well, unmatched. So I panicked and emailed a few of my favorite blogger friends (thank you, Katelyn, Cassie, Courtney and Michaela!) with the below edited pictures (which show the dresser where we originally planned to place it in the room) and a HELP! subject line. White or gray, white or gray?! Ultimately, the girls told me that either would make a fabulous choice. By then, the gray was growing on me... and let's just be honest- David and I decided to skip the hour-long drive to Ikea and thought of having to put together another dresser, so we just held on to the gray. I am SO glad I did. 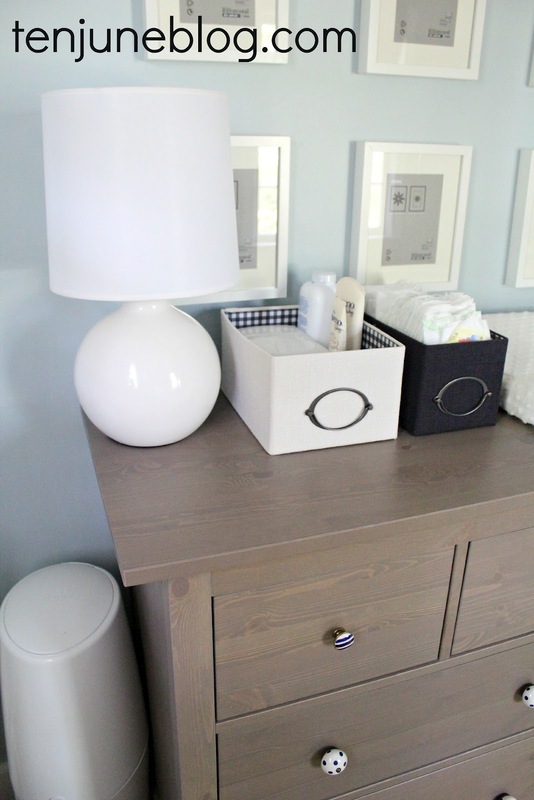 I big time love the gray dresser in the space! I added some adorable navy blue + white knobs (bought on sale at Hobby Lobby) to give the piece a little custom flair. I love the gray-brown color in there now that I've paired the dresser with a ton of white accessories, like a white changing pad, a gallery of white Ikea Ribba frames (that will eventually be filled with photos of both mine and David's family) and my new prize possessions- the gumball Land of Nod lamps. 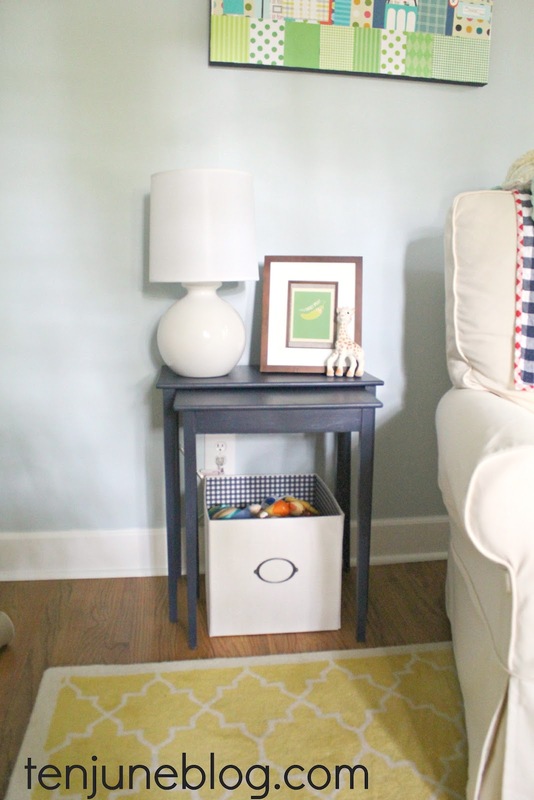 The Land of Nod was gracious enough to send a pair of these lamps over for my review. I literally could not be more happy with them! The size, height and style of the lamps are exactly what I was looking for for my little guy's space. The lamps came with not only the crisp, modern white shade, but also energy-saving fluorescent light bulbs, whose environmental friendliness made David a happy camper. I absolutely love Land of Nod and couldn't speak more highly of them. If you'll remember from this post, we purchased our crib from them and have been thrilled with it so far. The Land of Nod furniture team (who had no clue I have any affiliation with LON as a blogger) even went out of their way to send me a thank you swaddle blanket after purchasing the crib- talk about great service! The other gumball lamp went to the nesting tables next to our glider. Perfection. 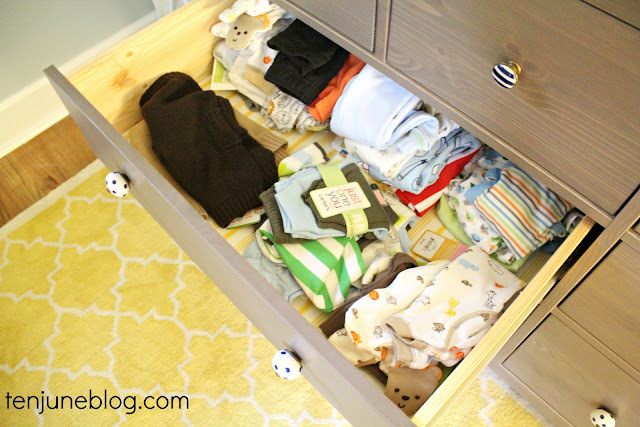 And this dresser does not disappoint with storage- we have plenty of room for not only baby Ten June's adorable clothes, but also diaper extras and accessories! this looks amazing lady and I am a huge fan of the gray! I love what you guys picked out! The nursery is definitely coming together! It looks fantastic. I just love it!!!! The gray and the gallery wall look great. Can't wait to see the whole thing! His room is absolutely adorable! How precious?! 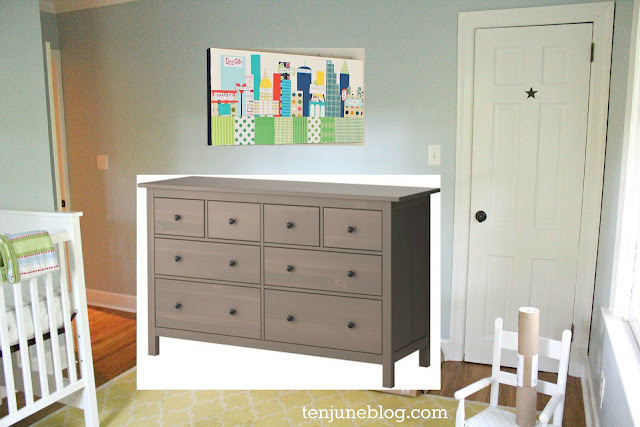 Love the colors and the gray dresser! I think the grey is perfect! Ps- are you left handed? The brown grey is really lovely- and I love the start of your gallery wall. The nursery is looking fabulous!! I love how your nursery is turning out! I love the grey dresser in there, you're right, it does keep it from being too matchy matchy, and I think it adds a little something special. And I die for photo wall collages! How did you manage to get them so perfectly aligned? OH, yay! I love the gray in there, Michelle. It looks fantastic. And how adorable to see all of those darling clothes folded and ready to go. So exciting. I'm so happy you went with the gray brown... it looks amazing with your blue walls! 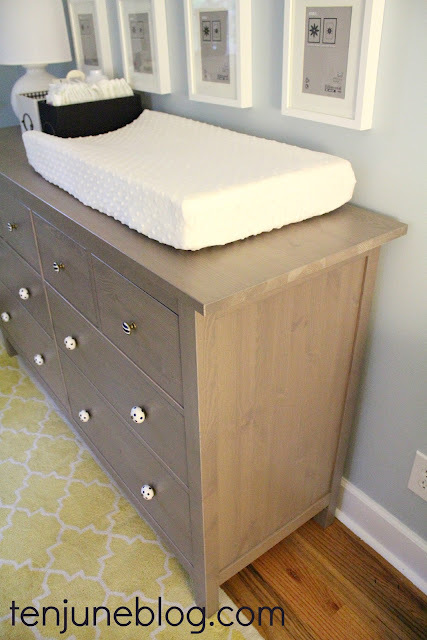 3 months in and we love the Hemnes as a changing table. 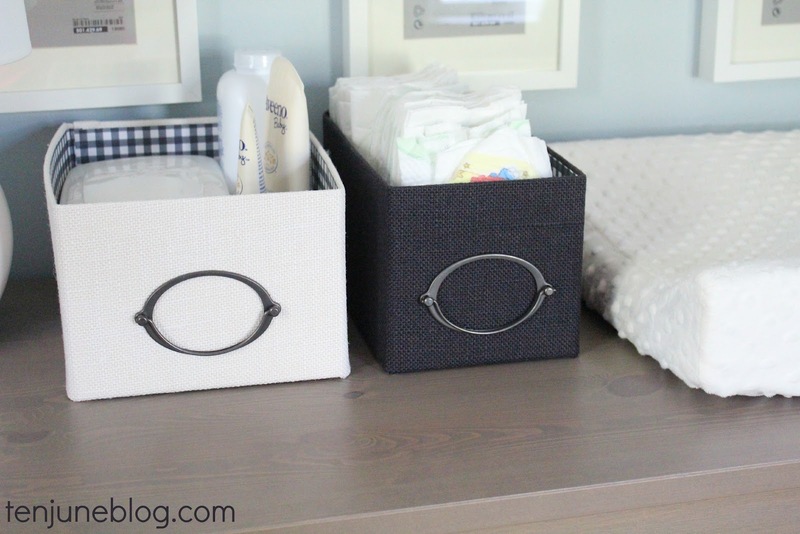 The little drawers up top are my favorite and help keep the top of the dresser nice and neat. 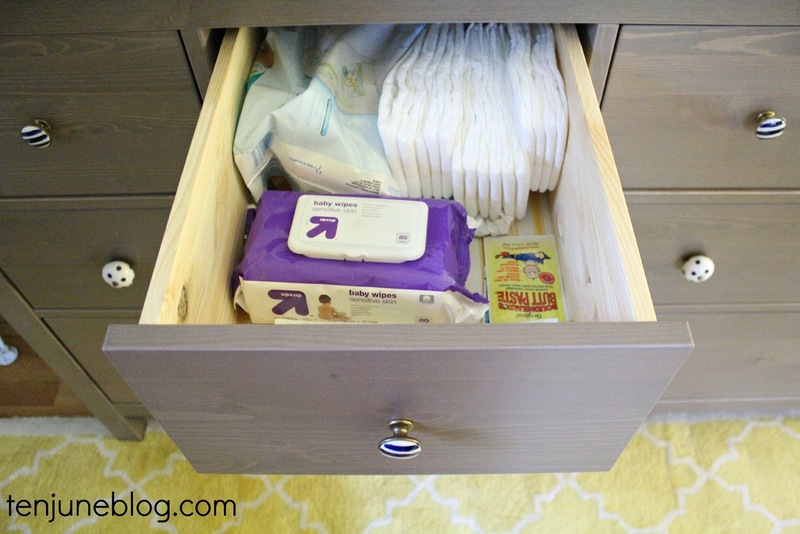 We keep cloth diapers in one, disposables in another, creams/nail clippers/brushes/medicine in another and bibs in the last one. We picked up some of the organizers that go in it which have been great. If there was a Hobby Lobby in NJ I would totally get those navy knobs! Thanks for the love and I can't wait until your little guy arrives! I think it's perfection, Michelle! 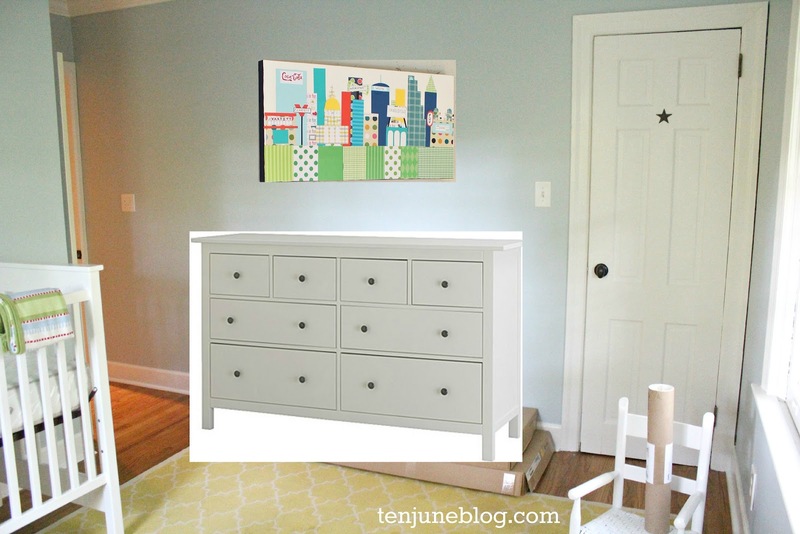 Plus that dresser will grow with him... little boys aren't too hip on white furniture down the road! And just an FYI, I bought two Ikea dressers waaaayyyy back in 1989 for my first apartment and they have stood the test of time! Apartment, house, baby's room, guest room, back to a kid's room or two, and now a dorm room!! I love the grey - and the knobs you chose are perfect! The gum ball lamps are too cute! I love the grey...I think it looks perfect!! Agree with what everyone else has already said - the grey looks really great! All you need is a sweet little babe kicking on top of the pad now! I think you went with the right choice on the dresser...it's super cute and warms up the space! We have the white version and I LOVE all the storage. It rocks! And the frames over the dresser are awesome! Can't believe he's going to be here so soon! The dresser and the room both look great! I'm sure you'll quickly realize that the very bottom row of frames, and maybe the one above that, are going to have to be removed as soon as your baby starts moving his arms and legs around at all. And the lamp is going to have to be moved elsewhere too. But it is pretty for now! I absolutely love the brown-gray color! I definitely think it works with the rest of the nursery. Especially with the added knobs. I just love it! It's perfect! I really like the grey-brown! I think it adds just a little bit of contrast in the room, which is important. Great little space! I definitely think the gray was the right choice! Especially with the white frames over it! The room is looking so cute! How much longer til Baby comes? I like the grey much better than the white! Gives it a little more boyish edge. The room looks great! I love the grey so much it really pops. I love the grey -- it brings some additional warmth to the room. And those knobs and lamps are just perfect. It's all coming together so well! you made the right choice! the gray is perfect!!! it's beautiful! this room looks ready for a new little bambino! We have the white one, it's perfect for a nursery! Lots of storage! Great choice :-) Can you remind me which rocker swivel you got? I am redoing my nursery right now for #2 and we need a comfy rocker this time around! I love the color of the dresser you chose! It is a great contrast with the wall color! Also, I LOVE your new blog design! I haven't I visited in a while, so I know this may be "old news" but it really does look great! The colors are so pretty!! One thing, I just wish I had taken more photos as time flies so quickly, people are right one blink and they are grown up so enjoy every moment while it is happening, even if it's the middle of the night and he still won't settle. I also love the color of all equipment.Nursery room is looking adorable with beautiful equipments of baby changing. Thanks for the nice post. Love your nursery and I really like the yellow rug. Where did you get that? Thanks Liah! The rug is a discontinued Pottery Barn rug I found on Ebay. It's called the Moorish Tile rug. Hope that helps! 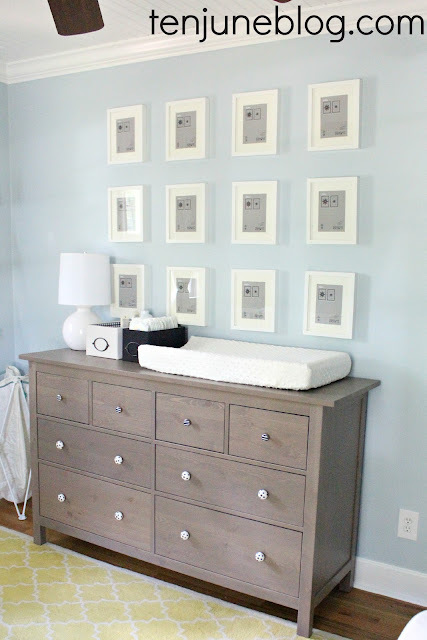 We just bought the same dresser for our nursery last weekend! I was doing a google search for knobs and came across your blog. Can you tell me the name of the paint color you used? Thanks so much! 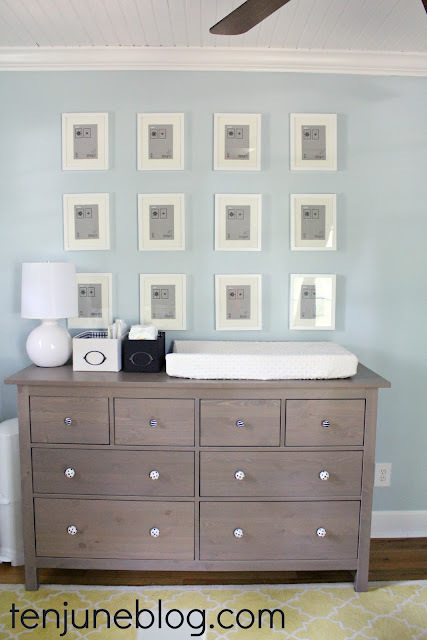 Your nursery looks amazing! Just saw your post with the source list that includes the paint color. Thanks! ;Hi! 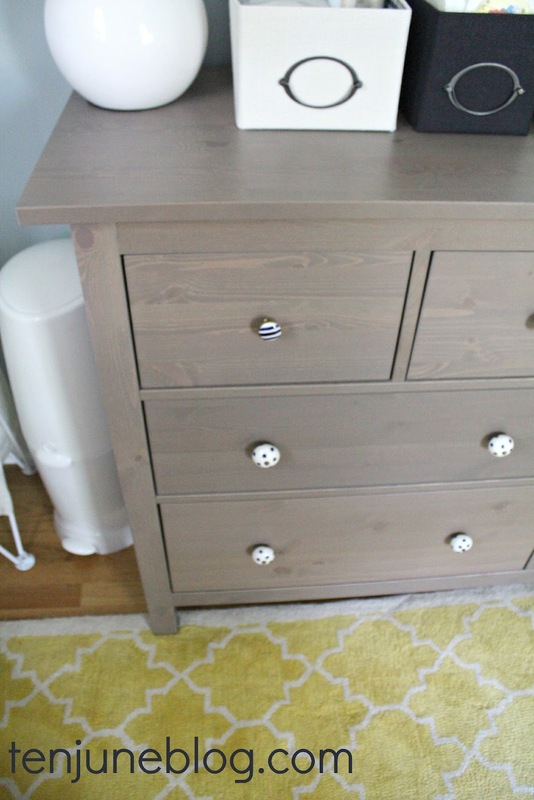 Where did you find this dresser in grey-brown? Is it only in stores? I'm wanting the grey-brown crib with this dresser matching in the grey-brown, but online I only see the options of black-brown; white & white stain. I'm planning on heading to the Cincinnati location soon but was wondering which location you shop. Looks great, Thanks!